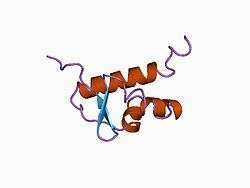 General transcription factor IIE subunit 2 (GTF2E2), also known as transcription initiation factor IIE subunit beta (TFIIE-beta), is a protein that in humans is encoded by the GTF2E2 gene. ↑ "Entrez Gene: general transcription factor IIE". Jeronimo C, Forget D, Bouchard A, Li Q, Chua G, Poitras C, Thérien C, Bergeron D, Bourassa S, Greenblatt J, Chabot B, Poirier GG, Hughes TR, Blanchette M, Price DH, Coulombe B (July 2007). "Systematic analysis of the protein interaction network for the human transcription machinery reveals the identity of the 7SK capping enzyme". Molecular Cell. 27 (2): 262–74. doi:10.1016/j.molcel.2007.06.027. PMID 17643375. Tanaka A, Watanabe T, Iida Y, Hanaoka F, Ohkuma Y (March 2009). "Central forkhead domain of human TFIIE beta plays a primary role in binding double-stranded DNA at transcription initiation". Genes to Cells. 14 (3): 395–405. doi:10.1111/j.1365-2443.2008.01278.x. PMID 19210545. Kang SW, Kuzuhara T, Horikoshi M (April 2000). "Functional interaction of general transcription initiation factor TFIIE with general chromatin factor SPT16/CDC68". Genes to Cells. 5 (4): 251–63. doi:10.1046/j.1365-2443.2000.00323.x. PMID 10792464. Langelier MF, Forget D, Rojas A, Porlier Y, Burton ZF, Coulombe B (October 2001). "Structural and functional interactions of transcription factor (TF) IIA with TFIIE and TFIIF in transcription initiation by RNA polymerase II". The Journal of Biological Chemistry. 276 (42): 38652–7. doi:10.1074/jbc.M106422200. PMID 11509574. Yamamoto S, Watanabe Y, van der Spek PJ, Watanabe T, Fujimoto H, Hanaoka F, Ohkuma Y (January 2001). "Studies of nematode TFIIE function reveal a link between Ser-5 phosphorylation of RNA polymerase II and the transition from transcription initiation to elongation". Molecular and Cellular Biology. 21 (1): 1–15. doi:10.1128/MCB.21.1.1-15.2001. PMC 86563 . PMID 11113176. Watanabe T, Hayashi K, Tanaka A, Furumoto T, Hanaoka F, Ohkuma Y (April 2003). "The carboxy terminus of the small subunit of TFIIE regulates the transition from transcription initiation to elongation by RNA polymerase II". Molecular and Cellular Biology. 23 (8): 2914–26. doi:10.1128/mcb.23.8.2914-2926.2003. PMC 152561 . PMID 12665589. Jawhari A, Uhring M, De Carlo S, Crucifix C, Tocchini-Valentini G, Moras D, Schultz P, Poterszman A (May 2006). "Structure and oligomeric state of human transcription factor TFIIE". EMBO Reports. 7 (5): 500–5. doi:10.1038/sj.embor.7400663. PMC 1479554 . PMID 16547462. Orphanides G, Lagrange T, Reinberg D (November 1996). "The general transcription factors of RNA polymerase II". Genes & Development. 10 (21): 2657–83. doi:10.1101/gad.10.21.2657. PMID 8946909. Kim TK, Ebright RH, Reinberg D (May 2000). "Mechanism of ATP-dependent promoter melting by transcription factor IIH". Science. 288 (5470): 1418–22. doi:10.1126/science.288.5470.1418. PMID 10827951. Ikeda K, Halle JP, Stelzer G, Meisterernst M, Kawakami K (January 1998). "Involvement of negative cofactor NC2 in active repression by zinc finger-homeodomain transcription factor AREB6". Molecular and Cellular Biology. 18 (1): 10–8. doi:10.1128/mcb.18.1.10. PMC 121442 . PMID 9418848. Holstege FC, Fiedler U, Timmers HT (December 1997). "Three transitions in the RNA polymerase II transcription complex during initiation". The EMBO Journal. 16 (24): 7468–80. doi:10.1093/emboj/16.24.7468. PMC 1170346 . PMID 9405375. Cirulli ET, Kasperaviciūte D, Attix DK, Need AC, Ge D, Gibson G, Goldstein DB (July 2010). "Common genetic variation and performance on standardized cognitive tests". European Journal of Human Genetics. 18 (7): 815–20. doi:10.1038/ejhg.2010.2. PMC 2987367 . PMID 20125193. Yu X, Li P, Roeder RG, Wang Z (July 2001). "Inhibition of androgen receptor-mediated transcription by amino-terminal enhancer of split". Molecular and Cellular Biology. 21 (14): 4614–25. doi:10.1128/MCB.21.14.4614-4625.2001. PMC 87125 . PMID 11416139. Yokomori K, Verrijzer CP, Tjian R (June 1998). "An interplay between TATA box-binding protein and transcription factors IIE and IIA modulates DNA binding and transcription". Proceedings of the National Academy of Sciences of the United States of America. 95 (12): 6722–7. doi:10.1073/pnas.95.12.6722. PMC 22611 . PMID 9618479. Liu L, Ishihara K, Ichimura T, Fujita N, Hino S, Tomita S, Watanabe S, Saitoh N, Ito T, Nakao M (February 2009). "MCAF1/AM is involved in Sp1-mediated maintenance of cancer-associated telomerase activity". The Journal of Biological Chemistry. 284 (8): 5165–74. doi:10.1074/jbc.M807098200. PMID 19106100. De Graeve F, Bahr A, Chatton B, Kedinger C (March 2000). "A murine ATFa-associated factor with transcriptional repressing activity". Oncogene. 19 (14): 1807–19. doi:10.1038/sj.onc.1203492. PMID 10777215. Okamoto T, Yamamoto S, Watanabe Y, Ohta T, Hanaoka F, Roeder RG, Ohkuma Y (July 1998). "Analysis of the role of TFIIE in transcriptional regulation through structure-function studies of the TFIIEbeta subunit". The Journal of Biological Chemistry. 273 (31): 19866–76. doi:10.1074/jbc.273.31.19866. PMID 9677423. Festen EA, Stokkers PC, van Diemen CC, van Bodegraven AA, Boezen HM, Crusius BJ, Hommes DW, van der Woude CJ, van der Woude JC, Balschun T, Verspaget HW, Schreiber S, de Jong DJ, Franke A, Dijkstra G, Wijmenga C, Weersma RK (February 2010). "Genetic analysis in a Dutch study sample identifies more ulcerative colitis susceptibility loci and shows their additive role in disease risk". The American Journal of Gastroenterology. 105 (2): 395–402. doi:10.1038/ajg.2009.576. PMID 19861958.